Hello, Gorgeous! 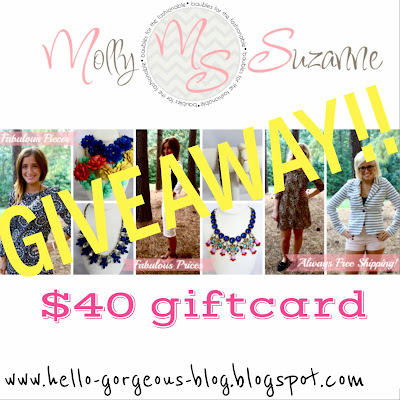 : Molly Suzanne's Gift Card Giveaway-CLOSED. I love the chrochet reim sweatshirt (just a touch of girly!) and the nautical polka dot scarf! (not together, but styled separately). So great!!! I'd love to snag the shapes all around cardigan. the perfect winter wardrobe addition! I've had a black and white striped blazer on my wishlist for FOREVER!! Thanks for the giveaway! the Missoni Mint Dress and a bracelet! thanks for the chance! I would not mind snagging some of those necklaces. The accessories are gorgeous! I would love the grey and white striped blazer. Thanks for the giveaway! The Bakit Up Dress in burgundy is stunning! I would love to have that one. Had I not followed your blog on instagram, I would have never known about the hidden internet gem that is Molly Suzanne boutique. Thank you for that, Yasi! ADORE that black and white tribal print cardi! Thanks for the giveaway. Oh boy! Can I file for bankruptcy now?!?! So many pieces I need!!! I love the bracelets, and dresses and necklaces and the list just goes on!!! Looks like I'll be "saving" a lot of money at this boutique! i love her bak-it up dress! i have my eyes on a few jewelry pieces too. molly is so great! Love the ANORAK HOODED JACKET and the Line up blazer in Black! If by the missoni mint dress unless the bakit up dress comes back in Stock! Love the leopard tunic and the sequin peter pan blouse!! Love the Hourglass Half Full Dress and the Jeweled Bangles! I'm loving the stripes around dress! 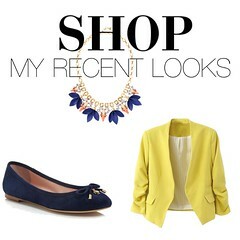 I love the Love Sweatshirt or Shapes Around Cardigan!! 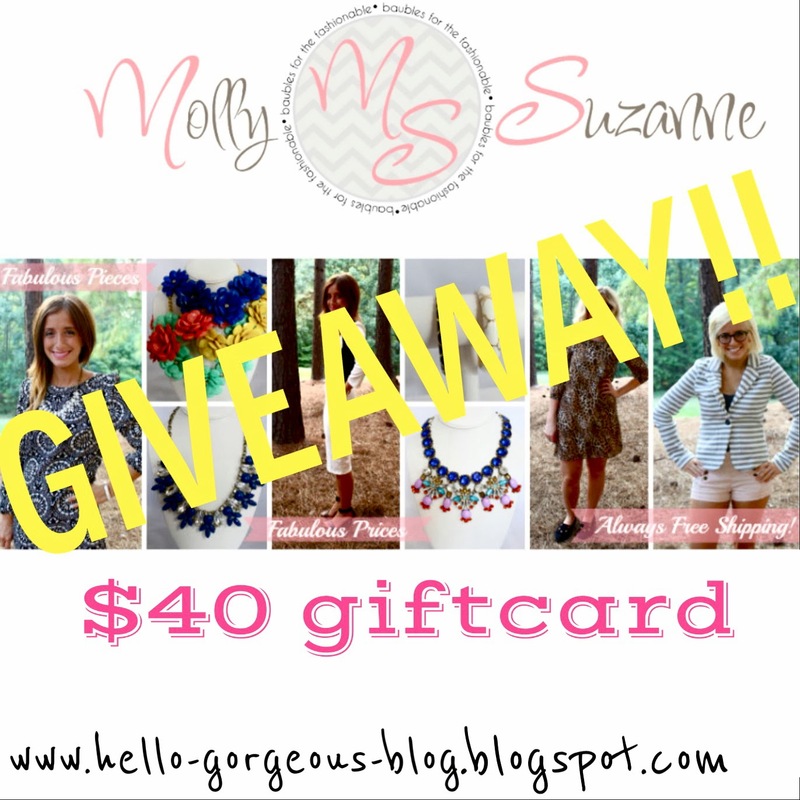 So many cute things over at Molly Suzanne! Love the Chevron Infinity Scarf in blue and Leopard Scarf. I love the Shapes Around Cardigan. I would get the gold trim leather dress. So cute! LOVE the shapes all around cardigan! he hourglass half full dress is so classy. It is different from most pieces of the boutique. I would wear this to my highschool's semi formal definitely. I have long legs and an athletic build, thisdress would high light allof my muscles and curves I have worked so hard for. With the forty dollar gift car, this dress would be my first pull! Love the necklaces at Molly Suzanne! The flower power is my favorite! What I really wanted was the link bracelet but it is sold out :-( But any of the tribal items I love also! And yes I love the bake it up dresses also! So much awesome stuff! love the arrow cuff bracelets and a ton of the cardigans. I literally can't even decide! It's all so gorgeous! I would buy the Missoni Mint Dress! I could dress it up and down in SO many ways. Also, I am loving the new Bakit Up Dress in Burgandy. It is my go to fall color and looks great for the Holidays! You have a lot of Canadian fans, can we get these amazing giveaway to be available here as well?? ! Wow...tough decision! But, I think I'd take the line up blazer in black. I love the blured lines shift dress! I love the Hourglass Half Full Dress! Hard to choose. I do love the dress you wore. Great scarves and cardigans, too. I love the Polka Dot LBD! So many cute things! So glad to have another place to Christmas shop for my sisters!